The Bulgarian President, Rosen Plevneliev, says he will open talks with political parties after election results were confirmed. Calling for a stable government to tackle the country's economic crisis, he said he hoped the new parliament would convene by the end of the month. He will hold his first talks with parties on Friday. Final results leave the centre-right Gerb party of ex-Prime Minister Boiko Borisov narrowly ahead with 30.5%. Its Socialist rival, the BSP, won 26.6% of the vote. Only two other parties passed the 4% threshold needed to enter parliament - the ethnic Turkish party Movement for Rights and Freedoms (MRF) won 11.3% and the ultra-nationalist Ataka took 7.3%. International observers say the vote was generally well run but add that scandals and fraud allegations have eroded trust in state institutions. The BBC correspondent in Sofia, Nick Thorpe, says it will be hard for either main party to form a credible coalition. Key tasks for the next government include negotiating EU funds for the next seven years, drafting the 2014 budget and trying to address popular anger over poor living conditions and high power prices. Gerb resigned in February amid protests over living standards and corruption in what is the EU's poorest country. 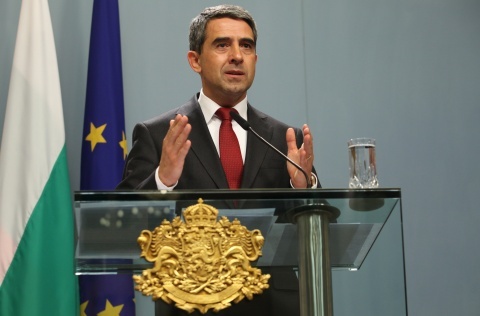 "It is important to have a stable government," President Plevneliev told reporters. "Bulgaria does not need new elections now. This will scare away investors." While the final figures for the vote were given on Wednesday, the exact seat allocations in the 240-member parliament were still unclear. The BSP could try to form a coalition with the MRF but it is likely it would still need the support of Ataka. Analysts say Gerb would struggle to form any coalition despite its lead in the popular vote. Another option would be to form a technocratic government, analyst Zhivko Gerogiev was quoted as saying by AFP news agency. "There is no other solution than a government of experts based on a programme with clear priorities," he said. "The alternative is new elections which risk to repeat the result of Sunday's vote."